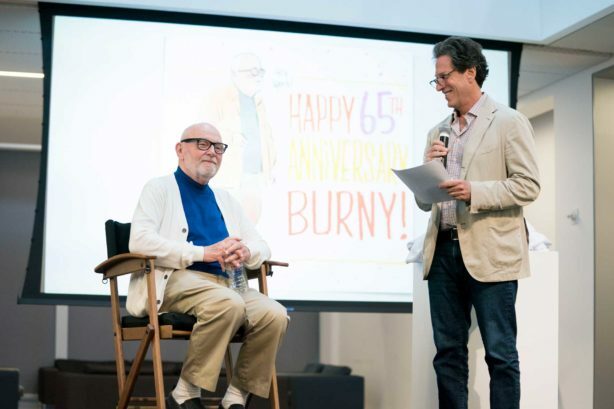 When Burny Mattinson started his career at Disney in 1953, he was one of only 700 employees working at the entire company. Walt Disney Animation Studios had released just 14 animated features, and Disneyland park was still in development. Sixty-five years later, The Walt Disney Company employs approximately 190,000 people around the world, Walt Disney Animation Studios will release its 57th feature later this year, and Disney has opened theme parks in Europe, Japan, Hong Kong, and mainland China, in addition to Disneyland and Walt Disney World Resorts here in the U.S. Mattinson continues to be a key member of the Disney Animation team, and on March 5, 2018, he broke a company record to become the longest-serving cast member in Disney history. Mattinson’s storied Disney career has taken him from his first job as a traffic runner on the Studio lot to work as an in-betweener on Lady and the Tramp, an assistant animator on films such as Sleeping Beauty and One Hundred and One Dalmatians, an animator on Robin Hood and a key animator on Winnie the Pooh and Tigger Too. Mattinson has worked in the story department on countless films, including Winnie the Pooh (2011) and Big Hero 6 (2014), and served as director on Mickey’s Christmas Carol in 1983, and in 1986, he wrote, produced and directed on The Great Mouse Detective. Walt Disney’s famed “Nine Old Men” served as mentors to Mattinson, who was an assistant to Marc Davis at the beginning of his career in animation, and who says Eric Larson was “like a dad” to him. What was supposed to be a three-week stint assisting Wolfgang “Woolie” Reitherman turned into something more significant: It marked Mattinson’s first major foray into storyboarding. The warm and gregarious Mattinson was a natural fit for the story department, which, he said, “I never left.” Throughout his own tenure with the Company, Millstein has been gratified to see Mattinson’s generosity with and mentorship of newer filmmakers. “In so many respects it is a defining characteristic of this studio: the generations that work together and the transference of knowledge, passion and artistry; and the principles of how we approach our storytelling and our filmmaking, and what we give to each other. That was apparent then, and it’s apparent now,” Millstein said. Oscar®-winning director Don Hall (Big Hero 6) worked closely with Mattinson during the production of Winnie the Pooh. Hall had high praise for the veteran animator’s artistry and his incomparable talents as a storyteller, but he found Mattinson’s support and encouragement throughout the animation process to be truly inspirational. “If Burny thinks it’s a good idea, it gives you the confidence to go forward with it,” Hall said.